When I was a complete hamradio freshman, I was pretty disappointed that an FT817 with a ATX-1080 in my backyard would not yield a single contact, despite trying for hours. And a little bit later, I thought I had fried my finals because CQ in CW would suddenly no longer get me any spots on RBN. I even sent the FT817 for repair then, but the only one at fault was I myself. Also, weak SSB CQ calls from “easy” countries are often ignored for long; calling CQ for an hour might still not produce a single contact, until you find a great ham radio veteran who remembers his own beginnings and answers your call. If you do not have access to an oscilloscope, you can use a few resistors and a diode so that cheap digital multimeter can give approximate readings. You can also use a few of the many SDR (software-defined radio) stations accessible via your Web browser to monitor the quality of your signal. A list is here: http://www.websdr.org/ (seems currently down, but will likely get back to normal operation soon). One more thing: When operating wire antennas with the FT817, it is good practice to put ferrite cores as snap-ons over all cabling attached (mike, power, earphone, digital …). Some of the inputs of the FT817 have rather weak protection against stray RF and you can kill the MCU and other components, I was told. This is why you should also not have antennas attached to both the front and rear connector at the same time; rather cover the unused one with a metal cover or dummy load. Indeed you can. There nothing against that in the SOTA rules so far, although you’ll find detractors and supporters regarding such procedure for chasing SOTAs if you search among the threads in this Reflector. With the poor propagation you need to think about which band and at what time you call. 5 W isn’t going to make a big impression especially in suburban reception areas due to their noise. So having alerted and then spotted, hopefully on a band with some chasers, but you get no replies after calling for say 5 minutes, what next? Check to see if the band is open. I tune to the FT8 frequency in each band in sequence. If I can’t hear any tones after 60 seconds then that band is closed except maybe for some very local people. Once a band is found that is open then it’s a matter of re-spotting and calling patiently until you get replies. I believe Sotabeams sells a good one for the FT-817, $50 for the kit. Much lighter weight and cheaper than an amplifier. I now do mostly CW, so I rarely use it anymore. I’m going to test my audio and listen to websdr see how I sound. It’s easy to get licensed nowadays, but if you don’t have an electronics or comms background, a lot of what actually happens and how radio works (or doesn’t) can be confusing and daunting. Pass the licence and then you are on your own despite there being on-air training as part of the curriculum. So maybe you need to join your local club where you can seek out face to face advice, help and support? There are lots of very experienced people on here who can give you advice etc. but actually being sat down with someone along with your kit can make the process of getting the issues you are having fixed a lot easier. I think you stay near Inverness? Why not come along to the local radio club IDARS (Inverness and District Amateur Radio Society). We meet on the 2nd and 4th Wednesday of the month at DMH Blacksmiths, 7 Carsegate Road, Inverness IV3 8EX.Check out our facebook page. I have done a lot of Sota activating. I have an FT817. We are a small club with several knowledgeable amateurs who are always happy to help. I think that you will also be more successful operating when you continue to develop an understanding of the underlying physics and electrical engineering challenges. Btw, there are tons of excellent tutorials on Youtube. this will naturally lead you to LC circuits, namely filters etc. If you do not want to design or build your own gear, I think you can focus on the problems from the antenna output of your commercial gear to the end of the antenna. You will probably not need to understand how a superhet works or the various oscillator circuits. But I bet ham radio and SOTA will be more successful and thus more rewarding if you understand why certain things will work and others don’t. This might take some time, but it is a very rewarding route. The only thing you need to avoid are the not-so-rare pieces of misinformation on the Internet. Stick with what can be traced back to high-school physics, and you will be on an excellent route. What you are experiencing is equivalent to learning on the job. Joining a club will help enormously, both with learning and with dealing with problems that will inevitably come along. I started in amateur radio and got licensed with virtually no experience while I was still at school. I can appreciate how you feel as I was licensed for 144MHz and higher frequencies and I had never listened on bands higher than 28MHz. VHF was a whole new ball game. Building my own equipment was a huge challenge and I would never have achieved it without the help of others. That was almost 50 years ago and I can honestly say that I still regularly learn something new. I would recommend that you find an Intermediate course and take the inter exam. Then sign up to the Bath Distance learning course for the full licence. This is a superb learning program which lasts 6 months and i guarantee you will understand all the basics after completing this course. It does take a lot of time though ! Just Google Bath distance learning for more info. 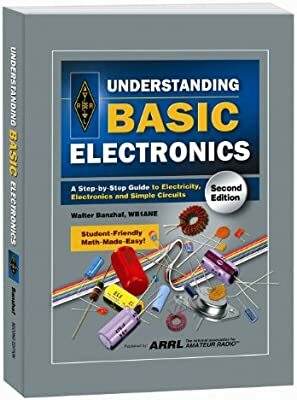 Introduces basic electronics, discussing analog and digital electronic circuits, Ohm's Law, and resonant circuits.